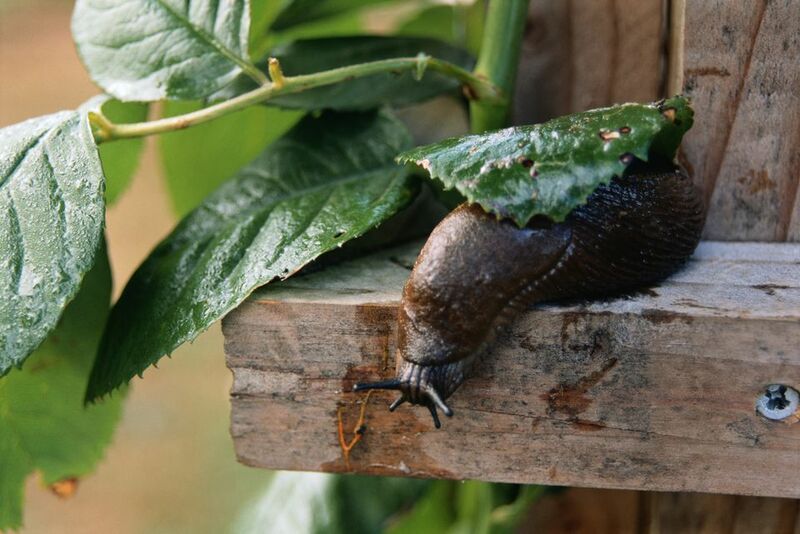 Slugs hide under leaves and cause a lot of damage in the garden. This usually happens before you even know they're there, but evidence of their chewing and their slimy trails are unmistakable. There are many ways to get rid of snails. Some gardeners turn to homemade or natural solutions, while others rely on commercial treatments. With so many different ideas out there, surely one or two will work for you. Beer: Slugs like beer and lots of gardeners have had success with putting out saucers or tuna cans with a small amount of beer, in which the slugs drown. Another idea is to leave a little beer in the bottom of a beer bottle, then lay the bottle on its side and press it into the ground so the opening is above of the soil line. Slugs go into the bottle but they don't come out. Salt: Directly spray slugs—at night, when they are out eating—with a strong solution of salt water. If the spray gets on the plants, water the next day to minimize damage from the salt. Crushed eggshells: Grind them into a powder and sprinkle it around the plants. Alternatively, put egg shells in a plastic bag, and step on them to make jagged pieces (not too large, not too small). Spread evenly around susceptible plants and re-apply as needed. Be sure to rinse out and microwave the shells for a minute or two to sterilize them and prevent rodents from coming to your garden. Copper: Copper wire, mesh, ribbon, or tubing delivers a light electric charge to slugs. Place it around planters and pots or perennials and other plants that won't get moved or dug up during the season. Oil soap: Mix 1 1/2 cups each of water and ammonia and 2 tablespoons of Murphy's Oil Soap. Put in a good spray bottle, shake, and spray the slugs directly. Shoes: If slugs travel across your yard on their way to the garden in the early morning, walk around wearing shoes, preferable without treads (so there aren't voids in the sole). Squishing slugs is gross but effective. Chickens: Most chickens eat slugs. If they seem to avoid large slugs, you can train the chickens to eat them by feeding the chickens pieces of large slugs. Chipmunks: If you already have a chipmunk problem, you might want to leave them alone—they eat snails. Use commercial slug control products with caution! Some traditional formulas are extremely toxic to pets, while many newer products are much safer to use. Diatomaceous earth: This natural material, sold in garden centers, hardware stores, and swimming pool spa supply stores, dehydrates and kills snails/slugs. Sluggo: An organic slug bait product made with the active ingredient iron phosphate, Sluggo is safe for pets and humans. Slugs eat the bait then move underground, where they die. Garden Safe Slug & Snail Bait: Another iron phosphate slug and snail killer. Bug-Geta: A slug and snail bait by Ortho, sold in granule form. Use only as directed. This product is toxic to pets and humans. What Plants Won't Slugs Eat? How Do I Get Rid of Earwigs in My Garden? Does Your Garden Need Diatomaceous Earth?